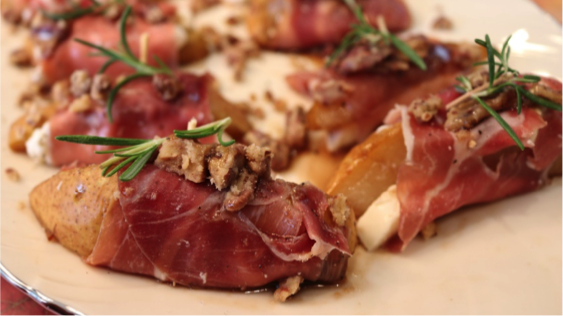 Blend honey and balsamic vinegar in a bowl, then dip the pear slices to coat. Arrange on a non-stick baking sheet, bake for about 25 minutes, or until tender, turning once. Remove from oven and cool. Cut the mozzarella into slices. The slices should be about as wide as the slice of prosciutto. Place a slice of prosciutto flat on a board, and brush with crème fraiche.